The biggest US companies, many with offshoots here, booked a reported $2.5 trillion overseas profits in 2015. THE IRISH OFFSHOOTS of large US multinationals reported a huge $135 billion in gross profits in 2012 – a sum worth more than half Ireland’s total GDP that year. That is according to a new study into the finances of Fortune 500 companies called ‘Offshore Shell Games’, released by Citizens for Tax Justice and the US Public Interest Research Group Education Fund. It also estimated that nearly three-fifths of the top 500 US companies by revenue, which make up the Fortune list, reported booking a combined $2.5 trillion in profits offshore to avoid taxes. The sum was up from $2.1 trillion reported the previous year. The study provided figures for the combined profits reported by American multinational corporations in ’10 notorious tax havens’ – a list that included Ireland, the Netherlands and Switzerland. It was sourced from data published by the US Internal Revenue Service (IRS), which looked at the foreign subsidiaries of US companies. The IRS figures, according to the report, revealed that US firms’ Irish subsidiaries reported combined gross profits of just over $135 billion in 2012, the most recent year for which figures were available. This sum was equivalent to over half of Ireland’s GDP for the year. The scale of profits reported by the Irish subsidiaries was second only to those booked in the Netherlands, where a combined $165 billion was recorded in companies’ Dutch branches. 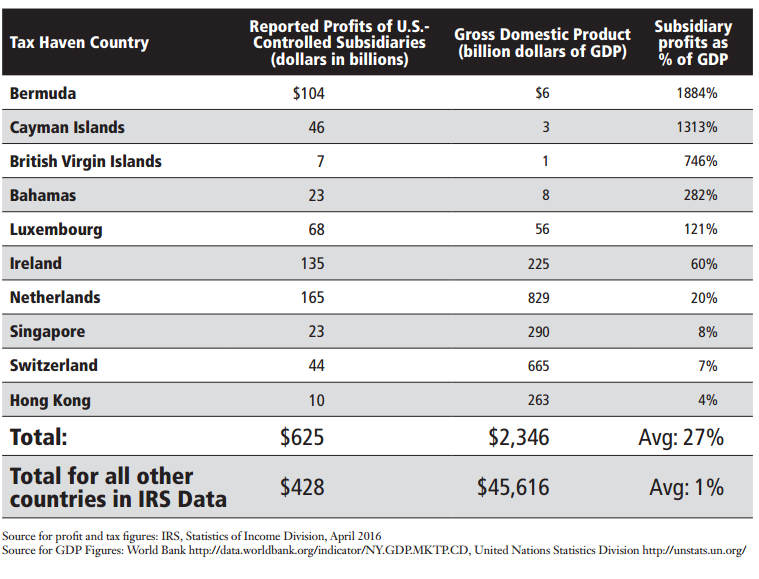 Other countries where US offshoots recorded large profits also included notorious tax havens such as Bermuda, the Cayman Islands and the Bahamas. Looking specifically at the Fortune 500 companies, many had multiple subsidiaries in Ireland – in some cases maintaining dozens of branches. International financial giant Goldman Sachs had the most Irish subsidiaries of any company listed with 64. 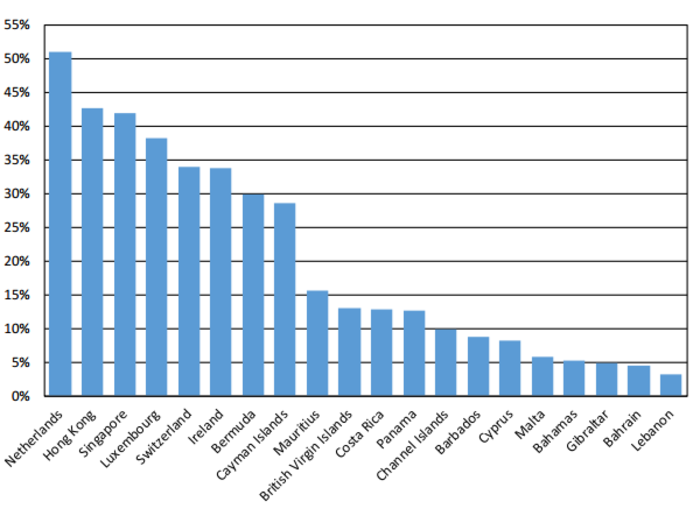 More than half of the 500 companies had subsidiaries in the Netherlands, while about a third had Irish arms. Several other large financial firms also had high numbers of Irish branches, such as Morgan Stanley and JP Morgan Chase, which had 45 and 13 respectively. The list also included Irish subsidiaries for household names such as PepsiCo, with nine, Apple, with three, and Facebook, three. The report noted that many businesses may have even more overseas offshoots that went unreported due to US rules for company filings. The report noted that Apple, which has its European headquarters in Cork, has booked just under $215 billion offshore – the largest offshore cash pile of any firm on the list. That amount left the tech giant liable for a potential $65 billion in US taxes if it repatriated the funds. The report also drew attention to the recent ruling by the European Commission which found that Ireland gave Apple illegal state aid worth up to €13 billion over a period of more than a decade and ordered the Irish government to recover the funds. “For years, one report after another has revealed how many of the world’s wealthiest companies manage to use tax havens to pay little to nothing in taxes on a substantial portion of their income. Perhaps the biggest outrage to date is the recent finding by the European Commission (relating to Apple),” it said. 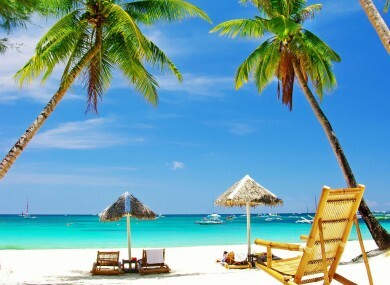 The groups called for the US Congress to prevent corporations from using offshore tax havens, adding that it should “close the most egregious offshore loopholes and increase transparency”. When asked to comment on the report by Fora, the American Chamber of Commerce, which represents more than 700 member companies operating in Ireland, said it does not “comment on individual members or advise members on their financial affairs”. The Irish government has consistently denied that the country is a tax haven. When Ireland was added to a list of countries denominated as tax havens by Department of Federal Revenue of Brazil, a spokeswoman for the Department of Finance said that the country does not meet the international standards for being considered a tax haven. “Ireland is fully compliant with all international best practices in the areas of tax transparency and exchange of information,” she said. Email “US firms are keeping billions in offshore 'tax havens' - and Ireland is high on the list”. Feedback on “US firms are keeping billions in offshore 'tax havens' - and Ireland is high on the list”.